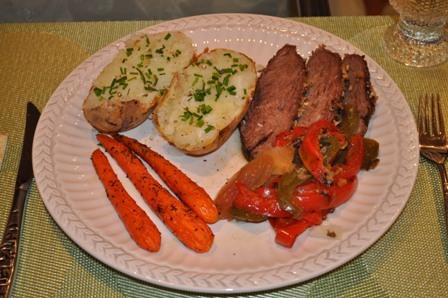 Beef Tri Tip Roast is a very popular cut of meat in California that is available all year long. This roast is typically marinated and then grilled. During the winter, I love this alternative method as it is great to cook and serve on cold, wet days. Beef Tri tip is a tender, lean beef cut that gets its name from its triangular shape. It is sold as a small roast from the bottom sirloin or cut into tri tip steaks. This delicious Baked Beef Tri Tip Roast recipe, comments, and photos were shared with my by Karen Calanchini, Food Stylist and Photographer, of Redding, CA. * Ponzu is a soy sauce which is infused with citrus and commonly used in Japanese cuisine. If you can not find this sauce in your local grocery store, use the recipe below and make your own. Preheat oven to 250 degree F. Line a baking sheet pan with non-stick aluminum foil wrap, large enough to be able to tightly wrap the tri-tip roast and vegetables. On top of the aluminum foil, place onions, bell peppers, and garlic in a line about the size of the roast. Sprinkle vegetables with salt and a few twists of ground pepper. Generously sprinkle the tri-tip roast with the Montreal Steak Seasoning on all sides; place on top of the vegetables and sprinkle with Ponzu Sauce. Wrap the aluminum foil tightly around the vegetable/meat mixture to keep the juices from escaping during baking. Bake approximately 3-1/2 to 4 hours. NOTE: Do not open the oven door and peek at the roast during this time. The odor in your house will be fabulous! 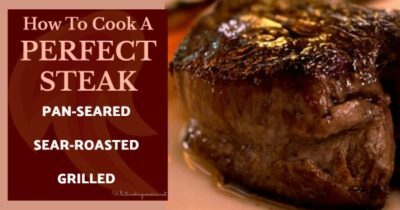 Remove from oven and transfer the meat to a carving board or platter, let it rest for 10 to 15 minutes before carving to allow the residual heat to complete the cooking and the juices to stabilize. Slice the meat into thin slices across the grain or shred the meat. The meat can be sliced and served along with the vegetables. Shred the meat, chop the vegetables, and then mix the shredded meat with the chopped vegetables and juices to use for tacos or burritos. Combine all the ingredients in a bowl. Cover and chill until ready to serve. Folks, you better tell people they need to slice this AGAINST THE GRAIN or they’re gonna have some tough meat.